Waiting. There are few things in life I despise more than having to stand in line to wait for something. Over the years I’ve developed a system of distracting myself better (with an ipod or kindle, etc) and feeling less anxious about standing in line to receive some form of service; however, may patience still can be tested. Standing in line waiting to have afternoon ‘high tea’ at the Peninsula Hotel in Hong Kong was certainly one of those moments. Initially we had been told it would take ‘only an hour’ to get a table for two. Looking over at Audrey I rolled my eyes, as is customary when I’m less than thrilled with a situation, and she quickly assured me it would be worth the wait. An excruciatingly boring hour went by and we were still only half way down the queue. At this point, I’m ashamed to admit it, I thew a bit of a hissy fit nearly bolting back to our tiny rented room in Mong Kok. Finally, after cooling down a bit, I decided I’d pull it together and just wait until we got a table. 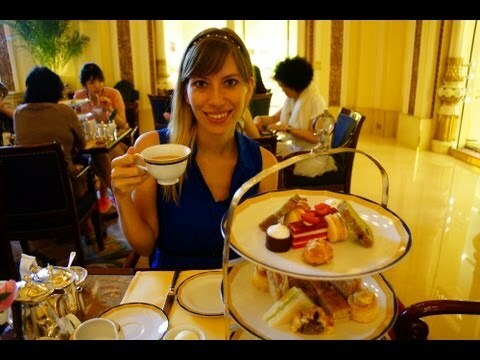 Having Afternoon English Style High Tea at the Peninsula Hotel in Hong Kong, China (香港半島酒店). I think of Ace Venture when I hear this song. We ended up having to wait two hours to get a table here in the Tea Salon. Initially they told us it would only be a one hour wait but by the time one hour had passed we had waited so long that we figured it was probably worth it to stay and now Sam is not very pleased. He’s looking at me with evil eyes. Are you freaking kidding me. Sam is hiding behind the camera because he’s so angry that he had to wait for two hours. That now I’m being punished by having to be on camera all alone. Okay, so if your’e looking to go afternoon tea in Hong Kong. The Peninsula is the place to come. This is the oldest hotel in all of Hong Kong and it’s super popular. The lineups really speak for themselves. Mmmm, so I got my self a nice little tea cup of mango tea. And it smells like fresh mangoes. So good. Mmmm, tropical. We’ve already dug into the food. We couldn’t help it. If you go to the bottom here we have the scones which we can eat with the clotted cream and jam. Over here we have some nice finger sandwiches with salmon, cucumber and up top we have the cakes and the macaroons and lots of other treats. So here I’m preparing my scones with clotted cream and jam. This is a favorite of mine. Whenever I go to London to visit my friend Rebecca I always end up staying at her house and I eat scones with clotted cream and jam three times a day. I eat it for breakfast, for lunch and also for my late night snack. So I always get fat when I go over there. The food was amazing. I think it was definitely worth the two hour wait. Although, I would have preferred not having to wait that long. Some favorites were the little lemon meringue tarts in a chocolate shell. Plus I really liked the scones with the clotted cream. Then they had sandwiches with salmon that were amazing. So I’m a happy girl. So I think it’s kind of funny that we had to wait two hours in line but it only took us 30 minutes to finish off all of the food in front of us. That doesn’t make sense. You waited HOW long?! Man, I like to think I am patient, but I’m not sure I am THAT patient. At least the food was worth it. 🙂 Thanks for sharing. LOL, I nearly gauged my own eyes out. The wonderful spread of food and tea did make up for it though but I would NEVER wait that long again. Two hours is a bit insane so I’m glad it was worth it! It looks amazing. I’m a big fan of clotted cream too and I can’t get enough when I’m in the UK. I’m pretty sure it doesn’t exist in the states 🙁 Thanks for sharing!